This book brings together leading practitioners and scholars engaged in professional development programming for and research on mid-career faculty members. The chapters focus on key areas of career development and advancement that can enhance both individual growth and institutional change to better support mid-career faculties. The mid-career stage is the longest segment of the faculty career and it contains the largest cohort of faculty. Also, mid-career faculty are tasked with being the next generation of faculty leaders and mentors on their respective campuses, with little to no supports to do so effectively, at a time when higher education continues to face unprecedented challenges while managing continued goal of diversifying both the student and faculty bodies. The stories, examples, data, and resources shared in this book will provide inspiration--and reality checks--to the administrators, faculty developers, and department chairs charged with better supporting their faculties as they engage in academic work. Current and prospective faculty members will learn about trends in mid-career faculty development resources, see examples of how to create such supports when they are lacking on their campuses, and gain insights on how to strategically advance their own careers based on the realities of the professoriate. The book features a variety of institution types: community colleges, regional/comprehensive institutions, liberal arts colleges, public research universities, ivy league institutions, international institutions, and those with targeted missions such as HSI/MSI and Jesuit. Topics include faculty development for formal and informal leadership roles; strategies to support professional growth, renewal, time and people management; teaching and learning as a form of scholarship; the role of learning communities and networks as a source of support and professional revitalization; global engagement to support scholarship and teaching; strategies to recruit, retain, and promote underrepresented faculty populations; the policy-practice connection; and gender differences related to key mid-career outcomes. 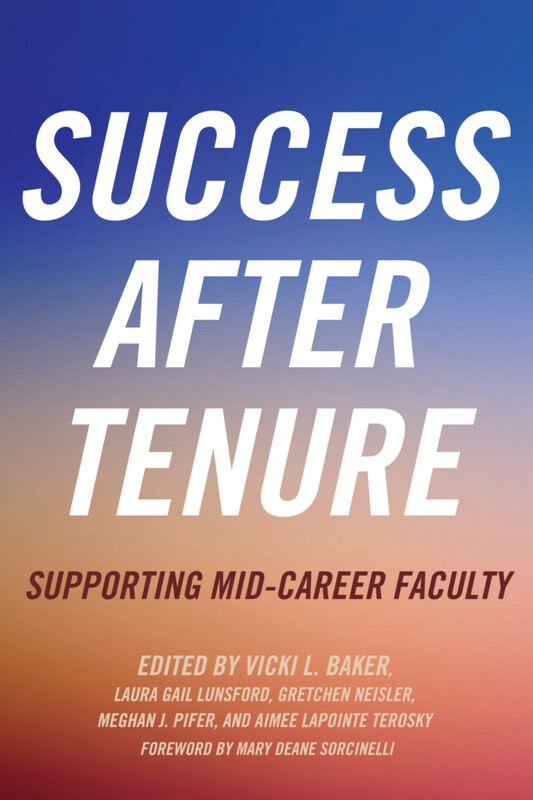 While the authors acknowledge that the challenges facing the mid-career stage are numerous and varying, they offer a counter narrative by looking at ways that faculty and/or institutions can assert themselves to find opportunities within challenging contexts. They suggest that these challenges highlight priority mentoring areas, and support the creation of new and innovative faculty development supports at institutional, departmental, and individual levels. Vicki L. Baker is a professor of economics and management at Albion College. Laura Gail Lunsford is a professor and the department chair of psychology at Campbell University. Gretchen Neisler is vice provost for international affairs at the University of Tennessee. Meghan J. Pifer is an associate professor of higher education administration in the Department of Educational Leadership, Evaluation, and Organizational Development at the University of Louisville. Aimee LaPointe Terosky is an associate professor of educational leadership at Saint Joseph's University.